The fort of Noviodunum for one of the most important centres of the defense system at the Lower Danube. The Celtic name Neviodunum, mentioned by Ptolemy, shows that the settlement was inhabited from the pre-Roman age onwards. This settlement was later overbuilt by a Roman bathhouse (thermae) and again overbuilt by a large late Roman fort. In the 1st century AD Neviodonum was a base of the Danubian naval force with prefects, a centurion. In Late Roman times also a trierarch was here, its force counting on sea ships (liburna armata). The late Roman fort was surrounded by massive fortifications, including large, impressive towers. The inside of the fort area has not been uncovered yet but a Christian basilica has been identified. The fort was reused during the Byzantine era. 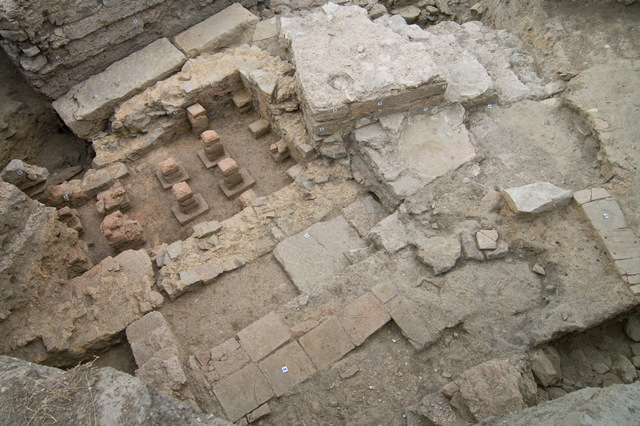 Around the fort a large civil settlement and cemeteries with numerous graves have been found, which can be dated to Roman and Late Roman age, as well as the Byzantine era. This civil settlement was possibly declared a municipality during the reign of the Severus dynasty. Late Roman maps demonstrate that it was located at a strategic and also economically important place, where important cross-roads of the Danube area met. According to Procopius and Hierocles, this town was also the place of the negotiations between Emperor Valens and Athanarich for the peace conclusion in the year 369 AD. During the VI century AD Noviodunum is attested as an episcopal centre.